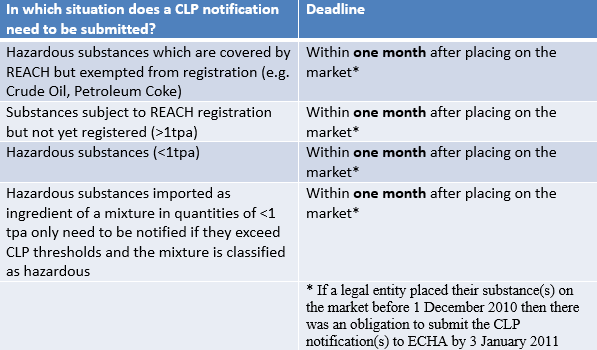 In order to facilitate harmonized entries for petroleum substances and sulfur in the CLP inventory, CONCAWE is providing IUCLID6 CLP notification files, consisting of Sections 1.1 (Substance identifiers) and 2.1 (CLP/GHS classification) that can be used for the notification of petroleum substances and sulfur under the CLP Regulation. Legal Entities that have registered Petroleum Substances or Sulfur under the REACH Regulation do not need to notify European Chemicals Agency (ECHA) separately of the classification of their substances under the CLP Regulation. This obligation is covered by the Lead Registrant in the joint registration submission. Further information on the CLP Regulation can be found on the ECHA website. Concawe has prepared CLP Notification files in IUCLID6 format. These files incorporate the latest Adaptations to Technical Progress (ATP) to the CLP Regulation. For each substance listed in the Concawe inventory, there is an IUCLID file, named eee-eee-e Concawe CLPNotification.i6z where eee-eee-e is the EC number of the substance (click here for files) except for Petroleum Coke (exempted from REACH and not classified). Use the Concawe inventory to find the substance identifier (EC number) of the substance to be notified. Companies having submitted CLP notification file(s) should update their CLP notification dossier(s). This requires that the updated Concawe CLP notification files are first implemented into the registrant’s IUCLID6 instance(s) and then used to create new CLP notification dossiers. A summary of instructions can be downloaded here. For Concawe’s recommendations on Classification and Labelling, please see Concawe C&L Report.